The Moon Grenade is one of the 7 different weapons included with the Big Loo Robot in 1963 (14 total items). It appears to have been designed specifically to be friendly to the grasping mechanism, AKA: Pickup Claw Hand. The long slender shaft and multiple shaped end objects makes it stable on the ground but present an excellent target to grasp. Specifically, those end objects are comprised of one circular shape and at the opposite end, a four sided – ribbed shape. The four sided ribbed portion does an excellent job of preventing the Moon Grenade from rolling around and gives Big Loo a chance to pick it up. Although many of the original accessories have name discrepancies caused by box labeling and other references, this item remains constant in terms of name. Current reproduction choices are available in two different colors, both light and dark green. It has been reported that Redvenon Repos has updated their mold for this item. Regarding color, apparently the Marx Factory line may have mixed slightly different color runs due to possible problems with basic material supplies or even human error. Collectors state that many of their Moon Grenades were light green. What color is yours? Do not despair if your Moon Grenade color differs, as apparently there was a smaller run of dark green grenades. As the Big Loo collector hobby grows, new finding are sometimes reported and only time will tell if there were even more color variations. Rather than viewing this as an irritation, one should embrace the continuing search for all 1963 Big Loo productions information as an exercise in learning more about this 50 year plus robot. So how do you tell if your Moon Grenade is original if there are different colors? 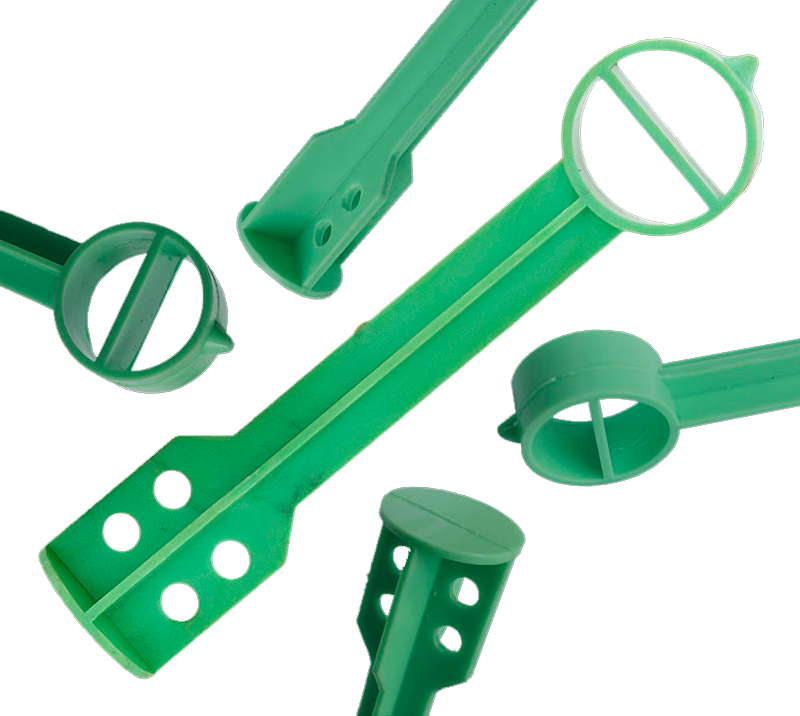 As with all the accessories from 1963, the parts were made on a large production line using the cost effective process at the time and known as Injection Molded Polystyrene. These days, small runs of reproduction parts are usually made using resin and poured into silicone molds. With Polystyrene, the material is injected into a die when extremely hot and forced into the Moon Grenade’s center shaft section leaving a Sprue or stub at the entry point. At the Marx factory, a production worker waited until the plastic cooled and simply snapped off the remaining material at the injection site leaving a tell-tail stub or “Sprue”. This is your clue that the part was injection molded and not resin poured. 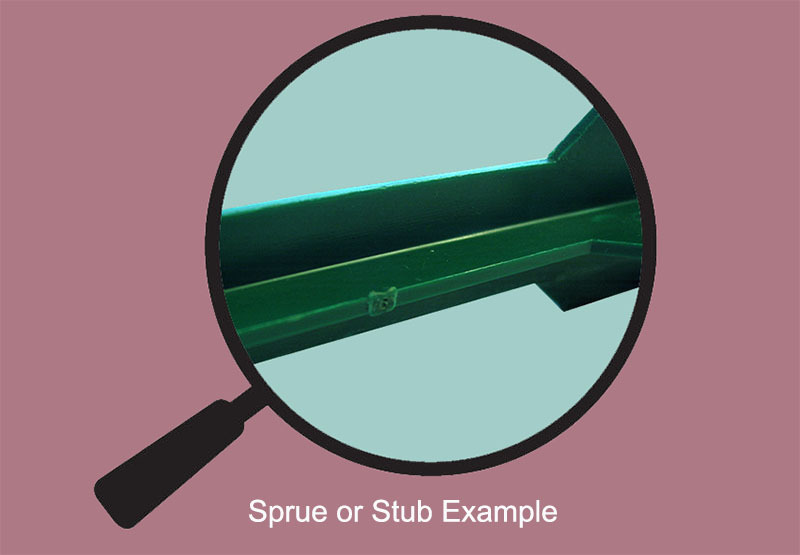 Sprue marks are very easy to see on any part that uses this process. It is extremely unlikely that if you plastic weapon has an injection Sprue scar, that it is a reproduction part. Another tip to identify Polystyrene is that the castings have very fine detail with crisp edges vs. softer details of resin. Use this technique when evaluating any of the Big Loo plastic accessories. One collector claims that the Moon Grenade has a more brittle sound when contacting a hard surface but that makes it hard to evaluate your Moon Grenade when you only have one example as opposed to processing two variations in hand. But exactly what is it and what is its purpose? Although we can extrapolate the intended use of many of the Big Loo weapons, the Moon Grenade is cloaked in mystery. To learn more about its possible use, find the article under “From the Mind of Big Loo” and enjoy a light hearted look from one Robot’s point of view. Other than the Robot’s thoughts, you will have to use your imagination as no official documentation exists on the Moon Grenade’s intended use. Lastly, we examine just how rare the Moon Grenade is compared to the other 7 different weapons. Possibly because this item may have been left in the Pickup Claw Hand when not in use or simply because it wasn’t being launched into the air and then lost behind the sofa, it tends to survive with the robot. Another possibility is that in the mind of a young Big Loo owner, how would you repurpose the use in a play role of this odd looking device? On the other hand, Space Spheres (Red Balls) and especially the items that could be removed and used for other play roles were far more susceptible to being lost. 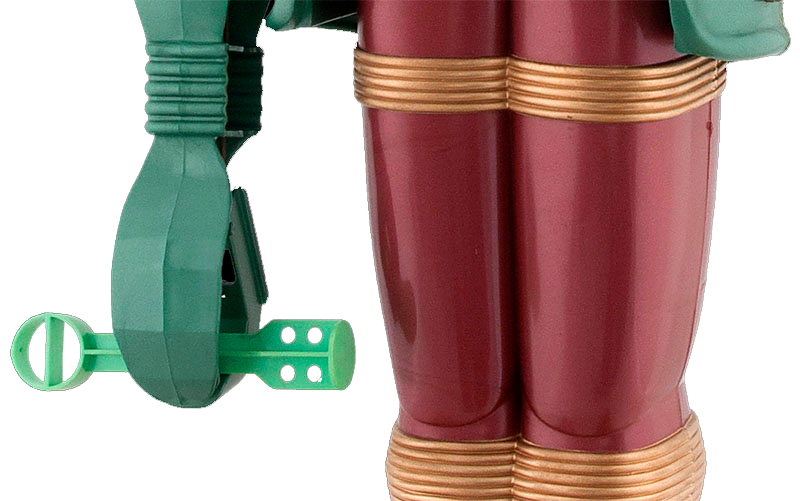 Among the most rare were weapons such as the Water Ray (Squirter) and the Sonic Signal (Whistle) which were far more common to be misplaced and not survive with the robot. Hi Big Loo. Love your website. I lost my robots moon grenade early on. Last year I was unpacking old boxes from my parents estate and you’ll never guess what showed up. Yup, one dark greene Moon Grenade! Keep up the great work LOO! I have owned three of you fellows – one at Christmas 1963, and two more since 2002. I sold one of them, and kept one (he’s on my desk as I type this). Keep the faith, Loo!